"MyFitnessPal is free, a MyFitnessPal account is free, and if you're dedicated enough to stick with them, the positive effects they can have on your health are priceless." In today’s fast paced, highly mobile society it is often much easier and cheaper to eat fast food on the go than it is to spend the time and money to east fresher, more healthy meals. MyFitnessPal wants to make the switch to a healthier lifestyle easier by helping you track your calories and activity levels, set your weight-loss goals, and monitor your progress. Losing weight and getting healthy is not easy. It’s even harder to do alone. But if you're looking for assistance, putting the MyFitnessPal calorie tracking app on your iPhone (or iPad, it's universal), is a great way to get keep you going in the right direction, and a great goal to consider for our Mobile Nations Fitness Month. After installing MyFitnessPal you have to enter your personal information. 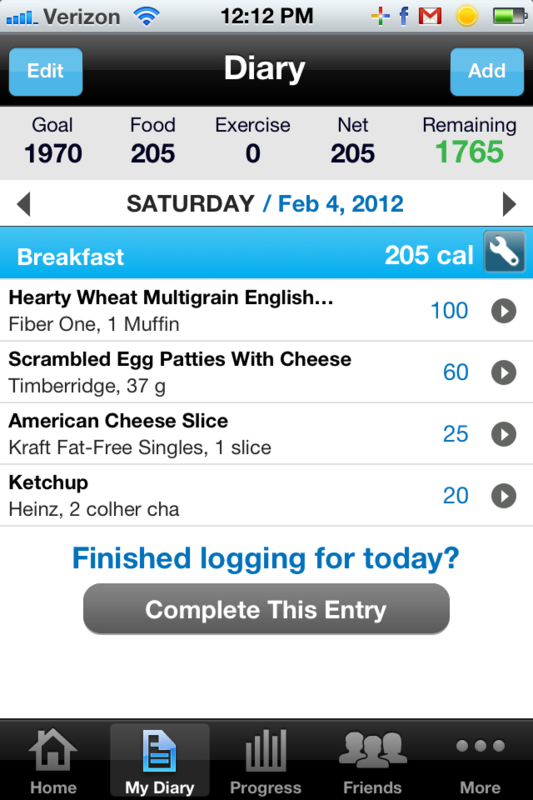 This helps create your calorie goal and intake needs for each day. The first page that launches gives you your calorie goal, and once you start inputting foods and exercise into MyFitnessPal it will calculate your remaining calories available for the day. Directly below this you will see a news feed that displays your updates, as well as updates from any friends you may have added through the app's social networking feature as well. There are a few ways to add food to your diary; the first is simply by clicking the Add to Diary button that appears right next to your remaining calories counter. From there you can either search for the food you are eating, or if there happens to be a barcode available, you can scan it right in. (MyFitnessPal does a good job finding most products.) The food database contains over 1 million entries for things as simple as an onion or slice of cheese to your favorite meal at Outback Steakhouse or the Olive Garden. In addition to logging the food you are taking in, it is equally as important to log any exercise you have completed for that day because that will help ensure that your calorie goal remains accurate. With over 350 different exercises in the application, logging the exercises you complete should take only seconds. 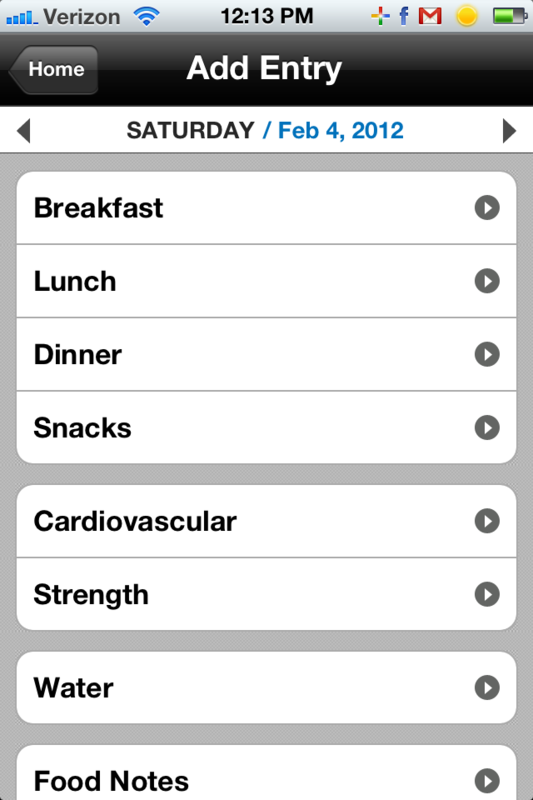 Each day you can enter your weight into the application to help you keep track and on the right path. 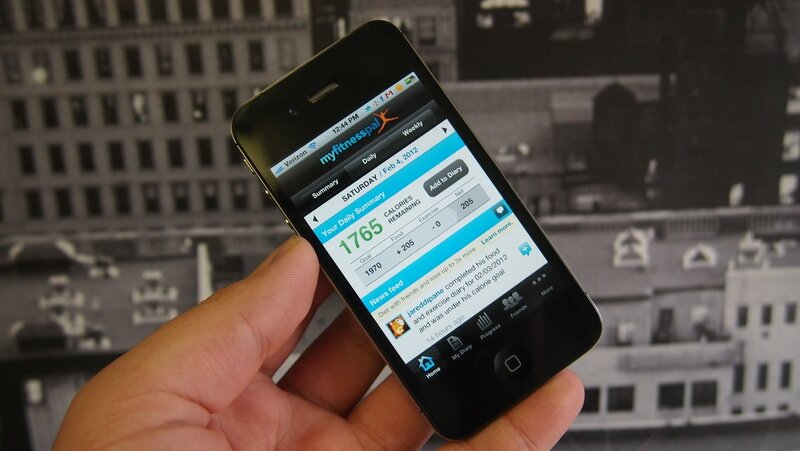 If you have a specialized fitness device, like a Fitbit, MyFitnessPal can interface with that as well. 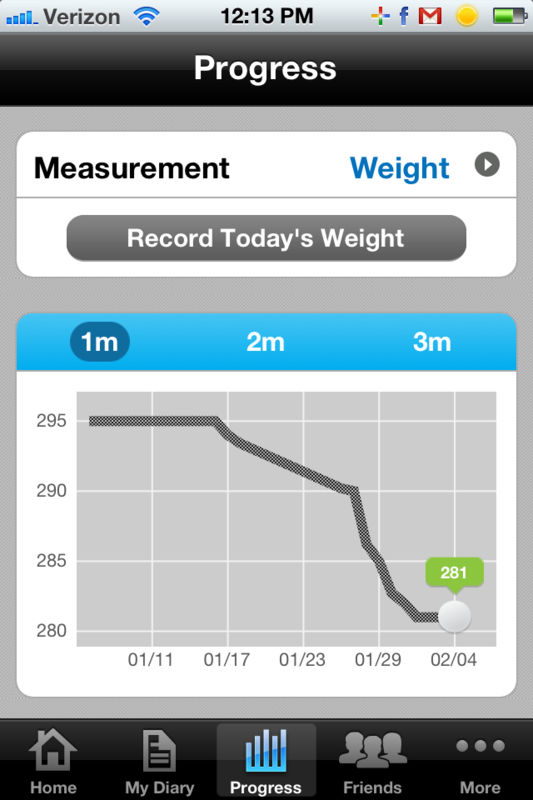 Your weight will show in a graph so you can visually see if you are headed in the right direction or not. At the end of each day there is a button to complete logging your food entries for that day, and this will then pop up a message which gives you how much you would weigh in five weeks if you continued to eat and exercise the way you did that day. 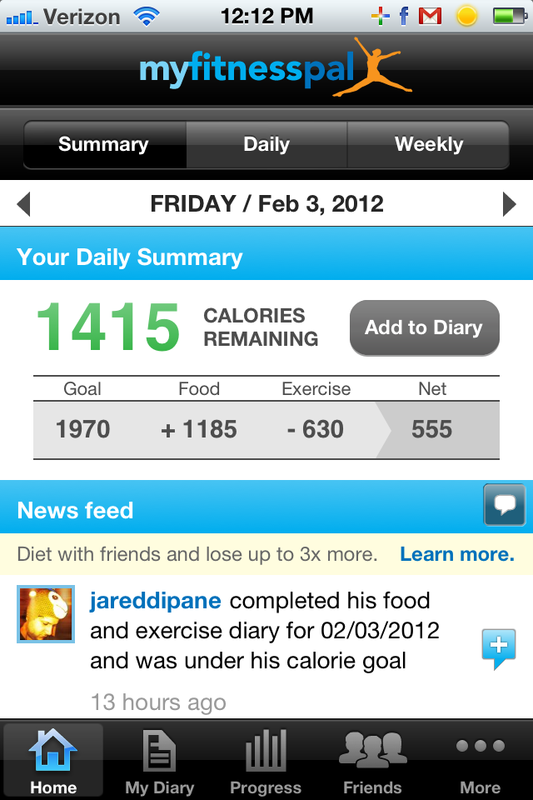 In addition to the iPhone app, MyFitnessPal also works on the iPad. The iPhone is ideal for entering data while on the go during the day, but the iPad is nice for looking over and analyzing your progress when you have more time. You can also log anything and everything through the MyFitnessPal website so even if you don't have your iPhone or iPad handy, you still have a way to stay on track. Cardio activities are more confusing to add since you don't always know the specifics of speed, heart-rate, etc. MyFitnessPal is is free, the MyFitnessPal account is free, and if you're dedicated enough to stick with them, the positive effects they can have on your health are priceless. It's the dedication part that's really important. You need to be completely honest about what you eat, how much you are working out, etc. If you're looking to take better control of your weight or your fitness, get MyFitnessPal and get one step closer to a healthier lifestyle.